The perfect template to organize and record small group guided reading instruction. Plan your weekly lessons, set goals, keep track of running records and make notes all on one form. Guided Reading running record form complete with accuracy, miscues and error analysis, words read, comprehension questions, and student strengths and weaknesses sections. 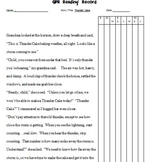 Guided Reading Lesson Templates and Running Record Forms! Running Record Forms for Fiction AND Non-Fiction! The same Guided Reading Running Record Form already on my site, but changed accuracy and comprehension points for levels L through Z. When working with a GPR group, you can assess a child's success with Patricia Polacco's beautiful story, Thunder Cake. 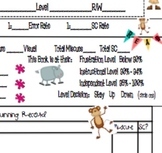 This running record form includes: a space for analyzing decoding errors and self-corrections, a fluency scale, and a comprehension assessment. When working with a GPR group, you can assess a child's success with Cynthia Rylant's sweet, slobbery story, Henry and Mudge and the Starry Night. 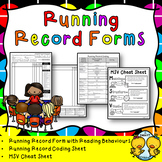 This running record form includes: a space for analyzing decoding errors and self-corrections, a fluency scale, and a comprehension assessment.